OUR STORY — Beetle Juice | The original VW cocktail bar - we bring the party to you! At the time we started Beetle Juice we were all working in various jobs, but could be best described as surviving rather than thriving. Between us we had worked in bars, travel agents, newspaper classified sales and talent agencies but always for other people, never for ourselves. We had an old VW camper van that we'd bought to use for trips to festivals and holidays and thought converting it into a cocktail bar would be a really cool idea, so after a short period of deliberation we decided it was time for us to follow our beliefs and try out our luck. 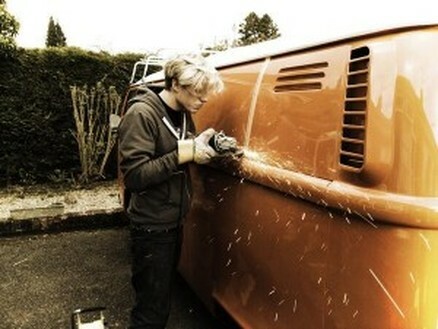 Taking an angle grinder to our cherished VW camper van to chop out a side and the roof was one of the scariest things we have done, (although serving cocktails at our very first wedding reception was a close second). Within a few weeks Gracie, our first mobile VW bar was born and we were attending our first ever event. We have come a very long way since then. We decided to make serving high quality cocktails our speciality and we chose the name ‘Beetle Juice’. In the early days we had no idea how enthusiastic everyone would be at the events we have attended and the enquiries that each event we attend would generate. In our first full year in 2013, we attended almost 50 different events; several of which covered multiple days. They included music and food festivals, sporting events, private parties, weddings, corporate events and school and university balls. We learnt a lot about which events worked well, which didn’t and how to optimise our pricing and operations. We finished the year by getting the angle grinder back out and creating our second converted cocktail bar, Gina the party girl. During 2014 we doubled the size of the business by being invited back to all the annual events we had attended in 2013 as well as adding many more, including some of the largest UK festivals, as we established Beetle Juice as a recognised brand. We finished the summer season in 2014 with 4 converted bars adding Bella and Alice to our fleet. Alice was the first van that we commissioned a specialist company to create to our design, rather than totally build it ourselves. 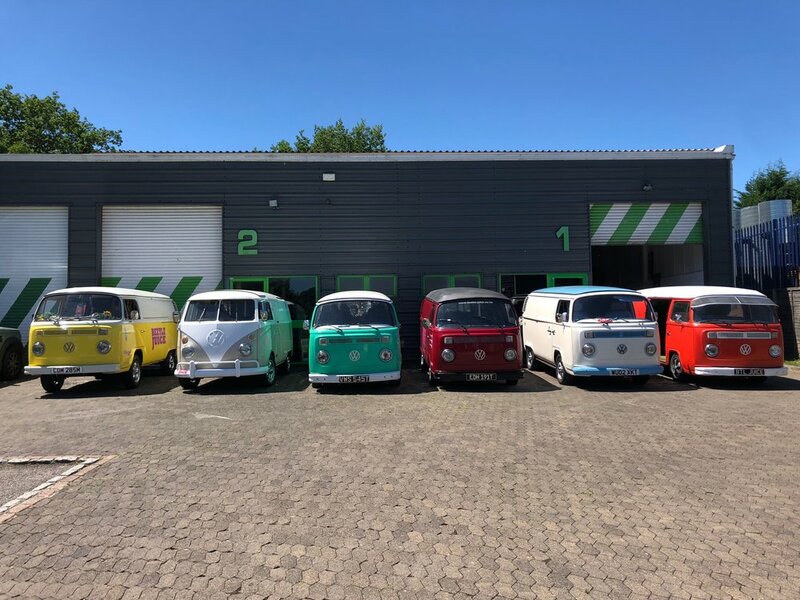 In early 2014 Steve and Sam joined the founders as directors of the business and during the summer of 2014, we started to source additional VW vans, acquiring a further 6 vehicles. 2015 was a bumper year for Beetle Juice as we built on our success of 2014. For 2015 we had 6 of our iconic bars attending events throughout the country, with a further 5 being acquired and built. We started to grow our regional coverage in the Midlands, the North, Wales, the South West as well as at our headquarters in the South East. 2016 was another continued year of growth and development of the Beetle Juice Brand. We had 10 bars operating some weekends and attended over 50 festivals together with our initial Franchise partners. We let loose the Beetle Juice Health Boost Bar, The Beetle Juice Champagne Bar and the Beetle Juice DJ Booth on to an unsuspecting public. We also started a partnership with Lanique who distil the truly unique 200 year old rose petal vodka liqueur of the same name. We launched the ‘Lanique bar’ for them in Spring 2016 and attended various shows, food fayres and events across the UK allowing the British public to try Lanique based cocktails or their signature drink of Lanique and lime. We took the Lanique bar 'Dixie' over to the Jersey home of Lanique, attending the excellent Jersey Fest and spent August up at the Edinburgh Fringe Festival. At the end of 2016, we acquired 6 new bars taking our total to 16 which we have been busy converting for 2017. We have also recruited some excellent new Franchisees to join our team for 2017. We have refurbished one of our left hand drive bars (Ellie), installed a full length USA flag on the roof and shipped it out to California for Ola who is our first International Franchisee and has an exciting line up of events that she is planning to attend in 2017. April, one of our first Franchisees has expanded her business by taking a second Beetle Juice bar and expanding her area across Manchester. She also opened her exciting new venture 'Aprils Kitchen' in Knutsford. We will be supporting an ever growing number of festivals, weddings, parties and events across the UK as we locate our bars at convenient locations around the country.